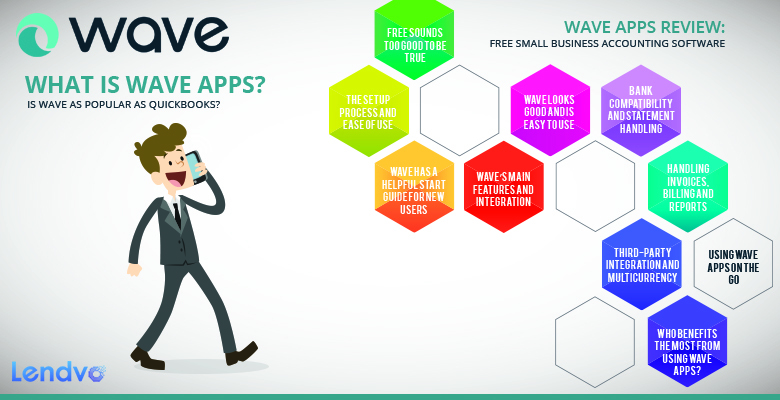 Free accounting, invoicing and payroll software – how could anyone not get excited about Wave Apps? Whether it’s tracking sales, billing customers or receiving payments, this software provides a way to do everything. In fact, Wave Accounting says it’s all anyone needs to manage small business finances. Does Wave Apps live up to the hype? Let’s take a closer look. Think of Wave Apps as a platform or an application suite like QuickBooks. This free and easy-to-use software gives small businesses a simple yet elegant way to manage their invoices, payments, payroll, accounting books and receipts. It works across multiple platforms such as PC, Mac and mobile and with any standard web browser. Wave syncs across your devices, making it easy to keep track of your books whether you’re in the office or on the go. Is Wave as Popular as QuickBooks? Intuit, the makers of QuickBooks, estimates a whopping 6 million users worldwide. Those are impressive numbers compared to 1.7 million users, according to Wave’s About Us page. Whereas you have to pay for some accounting software, Wave offers its apps for free and with similar features as QuickBooks, including customizable reports and automation. You can even integrate Wave Apps with Stripe and PayPal. For $9 per month, you can access the Plus Package and receive live chat support between 9 a.m. and 5 p.m. EST Monday through Friday. Most small businesses will do fine without the premium services. Though they come in handy when you run into a problem, you should be okay if all you need to do is manage your books. The Advanced Package costs $19 per month but comes with phone support during regular business hours. For a single charge of $49, you receive live chat and phone support for three months. Payroll will cost you $15 per month and an additional $4 per employee. You only have to pay $1 per person after 10 employees. Everything with Wave Apps is done on the cloud; therefore, you don’t have to install anything manually on your computer. You will, however, have to install the applications on your mobile device if you want to work on the go. You need to create a free account to begin. You can either create an account using your email address or by signing in with your Google or Yahoo account. Once you’re done, you can log in and access the home page. New users to accounting software can access the free Wave University and learn how to go from shoebox accounting to professional accounting without the hassle and confusion. With Wave University, you can learn how to use Wave, categorize your books, record sales tax and vendor info, scan receipts and work with other advanced topics. Though the free version of Wave doesn’t come with live support, you can find plenty of helpful resources on its website. It also has a FAQ page for getting quick answers to your questions, including a request page for getting help or reporting a bug. You will have to wait in line for help and may not hear from someone within 24 hours, but the option is there and good to see. Wave has a modern interface with everything readily available at the click of a button. You can find all of your apps on the left side, a recent activity section in the center and a financial snapshot or other related information on the right depending on which tab you have selected. Colorful graphics make for easy identification and comparisons when checking out expenses, income and other financial information. Whether it’s Wave Bills, Reports or another app, you get instant access to the information once you click the tab. In addition, all of your information is saved on the cloud and easily accessible no matter which device you’re using. Cloud computing offers many benefits, from maintaining productivity to ensuring security and reliability. Wave takes cloud accounting to another level, presenting you with all the tools to manage your books without relying on additional software to install and configure. Everything just works and is ready to go when you are. Though the user interface looks great, it may not always be the easiest to use for those who are new to accounting software. Wave also has minor issues like rejecting a form if you type the incorrect information in a text field. For software that has only been around since 2009, it offers a lot when compared to industry-leading accounting software like QuickBooks. You can use the search option to find your accounts quickly and easily. Adding journal transactions for every single account is also done within the same menu. Wave includes all the features that a small business would need for managing its accounts, such as invoicing, importing bank statements automatically and multicurrency. Though Wave offers payment processing, it’s only available with Stripe integration. You also won’t see a payroll feature unless you purchase the add-on. Wave supports more than 100,000 financial institutions. Whether you bank with Wells Fargo or Bank of America, Wave automatically imports your statements daily. However, it doesn’t put them in a separate list. Instead, it adds them to your transactions. For people who forget to import or categorize their statements, this auto-import feature saves time and prevents headaches later. Wave imports your statements according to keywords, not vendor information or customer names. It matches imported transactions with previous ones, using the keywords in the description to categorize them. Depending on the description, Wave may not always categorize your transactions correctly, so importing them yourself may give you peace of mind if you don’t trust the auto-import feature. Wave gives you the freedom and the power to create invoices directly in the application and export them to PDF files. You can even share a URL with your customers and let them view the invoices online. Though your customers can pay via credit card on the invoices, it only works if you integrate the app with Stripe. You will have to pay 2.9 percent plus 30 cents for each transaction, so keep that in mind when comparing prices with other merchant service providers. Creating an invoice with Wave is easy. Simply fill in the text fields with the appropriate information, and save, view or edit the invoice before sending it. Invoicing also has many advanced features in Wave, such as giving you a way to send estimates, set up recurring invoices and save bills. If you add tax rates to your invoices and bills, Wave will automatically apply taxes to each item. You can view the reports in your web browser or export them to a PDF file. Wave also gives you the option to export the reports to an Excel document or a CSV. Depending on the report, you can set the time frame and also choose the data sources. Don’t expect to find hundreds of integration software for use with Wave. As of this review, it only integrates with Stripe, PayPal and Etsy. According to Wave, it’s testing an API that could lead to better integration in the future. For now, you won’t be able to integrate cloud storage like Google Drive or web-based project management like Basecamp. Wave focuses most of its attention on U.S. and Canadian users. However, it does allow for international transactions. Though you can link your foreign currency bank accounts and receive payments, the converted US$ value may not always be accurate. Wave Payroll comes with even more features for the money, such as free email, phone and chat support. It integrates seamlessly with Wave Apps and offers streamlined year-end filing. If you use a tablet or a laptop, you can access your Wave account easily in the Chrome, Firefox or Safari web browsers. For those on Android and iOS devices, you can install Receipts by Wave from Google Play or the App Store. With this application, you can enter receipts into your system by taking a photo with your phone. Afterward, you can edit and confirm the purchase before saving it to your account. Invoices by Wave is a mobile app for iOS devices. Use it to create and send unlimited invoices, review your receivables and process payments. It also has customizable invoice templates, charts and graphs showing revenue and expenses, and notifications to keep you informed when you’ve been paid or an invoice has been viewed. Wave does not offer this application for Android devices as of this review. Who Benefits the Most From Using Wave Apps? Make no mistake about it: Wave was created for small businesses with fewer than nine employees. Wave Accounting even states this information on its About Us page. It targets mostly freelancers, contractors and entrepreneurs who run small companies and need to manage their books more efficiently. It’s also for one-person shops that can’t afford expensive accounting software but need the tools to manage and organize their finances. Wave’s simplified design makes it easy for those who have no background in accounting. Since it’s free to use, that’s one more reason to give it a try. Other accounting software, such as QuickBooks, may have more advanced features, but you have to pay for those features and learn how to use them. If you have a small business and need to manage your finances but lack the money for expensive accounting software, you should sign up for a free Wave account. Because it costs nothing to use, you can try it and see how well it works for your needs. As your business grows, you can always take what you’ve learned from using Wave and apply it to QuickBooks or another advanced software down the road.